Hello everyone, welcome. 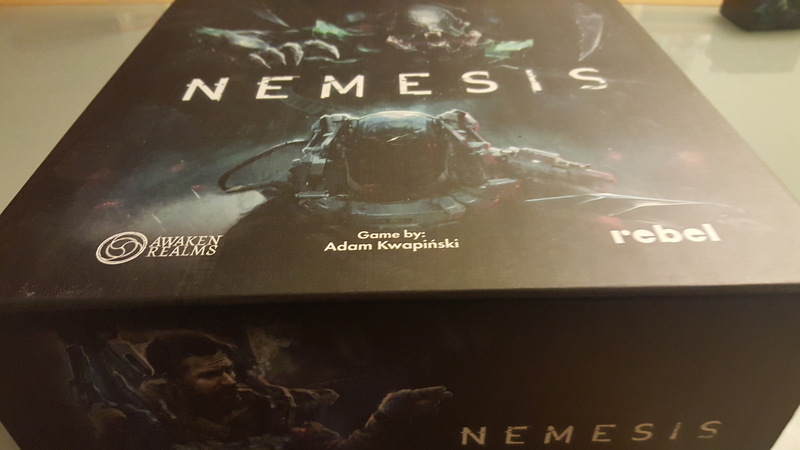 Today I am writing about my experience playing the Awaken Realms game, Nemesis. Nemesis is a survival exploration sci fi horror type game that felt very much like something from the Alien franchise, the premise being that players take on the roles of members of the crew of the Spaceship Nemesis. They awaken, presumably midflight to discover that things have gone wrong and the ship just might be infested (It definitely is) by alien intruders. Add to this the fact that you actually don’t know where the various rooms and systems are aboard ship, presumably this is justified as temporary amnesia brought about by hibernation. The game is basically coop though technically you each have individual objectives and they may run contrary to other objectives held by other players. You start with a corporate objective and a personal one. Anyway, I am getting ahead of myself. I chose the Scientist character. I decided he was Professor Vulcan of Miskatonic University, Professor of Scientific Sciences. My personal goal was to explore the ship and send a signal (one of the things you can do is send a signal from the communications blister). My corporate goal was to determine the Egg weakness. And that brings me to the next part of the game. There are aliens. Lots of aliens. And they are more than a match for Professor Vulcan whose only combat expertise is being the President of the Duke of Queensbury Rules fisticuffs club at Miskatonic University. Actually, I made all of that up. You don’t name or give the characters backstories. I did, but it isn’t part of the game. He actually had a pathetic laser blaster which would likely be as effective as Queensbury rules boxing with aliens. However, as you progress, it is possible to check alien carcasses, victim carcasses and eggs for genetic weaknesses of the intruders. My corporate goal was to find the egg weakness. Play is straightforward. You draw a hand (5) of action cards from the character deck. Each character has unique actions and various locations also have unique actions. Players take 2 actions, either playing one of their actions and discarding the corresponding card, or doing the location/general action and discarding a random card (or cards in some cases). So, a general search of a room would require discarding 2 random cards, or 1 search card if you have one. Movement to a new location requires the discarding of a card and this is where the tension comes in. As you explore new locations, and hopefully not generate noise, you flip over room tiles to determine the locations around the ship. So, you might find the surgical unit, armoury or even the shower room. Each location has a status effect on it, for instance it might be malfunctioning, on fire or even covered in slime. As you explore you want to try and repair malfunctions as once the last malfunction token is placed, you lose the game. Same with fire. When the last fire token is placed, you lose the game. And the actual grenade allowed him to do a whole pile of damage to the intruder as he hurried away. I completed my corporate objective, by finding the alien weakness via an egg study (Looks like Prof Vulcan is up for a bonus this year…) and could have fled to the hibernatorium, but as Chris had saved my hide on more than one occasion I felt obliged to try and help him. Unfortunately this ultimately led to me being mauled by aliens, infested with their parasites and the ship actually became overrun with fire and we lost. (no bonus for Prof Vulcan. No rest of his life either, for that matter). But I get to claim moral high ground and blame him, right? Nemesis was a fun game, and considerably less complex than it looked. It flowed very quickly and was over in about 90 minutes (there were only 2 players, mind you). We did rather well for noise early on, it was quite a while into the game before aliens showed up, and then after that point it was quite intense trying to make moves without alerting the intruders to our presence, which felt quite thematic and even cinematic. Not a game I backed myself, nor would I buy it, but certainly one I would play again. This sounds like it would be such a fun game!